18 June 2006: The world’s urban poor are worse off than their rural relatives, According to a report by UN-Habitat, the UN’s human settlement programme, it is a myth that urban populations are healthier, more literate or more prosperous than people living in the countryside. The report provides concrete data that shows that the world’s one billion slum dwellers are more likely to die earlier, experience more hunger and disease, attain less education and have fewer chances of employment than those urban residents that do not reside in a slum. But the report also cites examples of how good housing and employment policies can prevent slums from growing. Launched at the 2006 World Urban Forum in Vancouver, the report “State of the World’s Cities Report 2006/7” explains that the urban poor suffered from an urban penalty: Slum dwellers in developing countries are as badly off if not worse off than their rural relatives. Eduardo Moreno, one of the co-authors of the report added that the research showed that slum dwellers, who represent today one out of three of the total inhabitants in urban areas in the developing world will die earlier than the rest of the population of the city. "They do not have the same opportunities in terms of education, access to health. They have less possibility of getting a job and they are suffering from many illnesses," he warned. The report shows similarities between slums and rural areas in health, education, employment and mortality. It shows how in countries such as Bangladesh, Ethiopia, Haiti and India, child malnutrition in slums is comparable to that of rural areas. In many Sub-Saharan African cities, children living in slums are more likely to die from water-borne and respiratory illnesses than rural children. Women living in slums are also more likely to contract HIV/AIDS than their rural counterparts. For example, in Ethiopia, child malnutrition in slums and rural areas is 47 per cent and 49 per cent respectively, compared with 27 per cent in non-slum urban areas. In Brazil and Cote d’Ivoire, child malnutrition is three to four times higher in slums than in non slum-areas. In most Sub-Saharan African countries, HIV prevalence is higher in urban areas than in rural areas; in Kenya, Tanzania and Zambia HIV prevalence among urban populations is almost twice that of rural populations. In all countries, women and slum dwellers are disproportionately affected, reflecting a general trend in the region. The report also debunks some commonly-held beliefs about people living in slums. Contrary to popular perception, young adults living in slums are more likely to have a child, be married or head a household than their counterparts living in non-slum areas. The report comes at a time when the world is entering a historic urban transition; in 2007, for the first time in history, the world’s urban population will exceed the rural population. Most of the world’s urban growth  95 per cent  in the next two decades will be absorbed by cities of the developing world, which are least equipped to deal with rapid urbanization. The majority of migrants will be moving to small towns and cities of less than one million inhabitants. Already, more than half of the world’s urban population lives in cities of fewer than 500,000 inhabitants, and almost one-fifth lives in cities of between 1 and 5 million inhabitants. As cities grow, so do their slum populations. 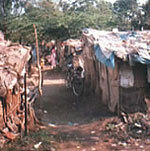 In many Sub-Saharan African cities, the slum population accounts for over 70 per cent of the urban population. Slums in Southern Asia, Western Asia and Sub-Saharan Africa are growing as fast as the urban population in general. Annual slum and urban growth rates are highest in Sub-Saharan Africa, 4.53 per cent and 4.58 per cent, respectively, nearly twice those of Southern Asia, where slum and urban growth rates are 2.2 per cent and 2.89 per cent, respectively. Northern Africa is the only region in the developing world where slum growth rates have declined significantly, largely due to the efforts of individual governments to upgrade slums or prevent their formation. 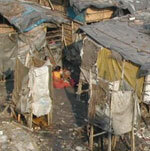 Globally, the slum population is set to grow at the rate of 27 million per year in the period 2000-2020. "Go to a slum area and then sort out the land ownership issue and bring water and sanitation and provide services, technical assistance for building sturdy houses because most of these houses are prone to disasters-floods," said Bazoglu. "You must have read in media that the first victims of floods or fires or whatever they are, are slums." The report notes countries do not have to be wealthy to get rid of their slums. It says some low- or middle-income countries, such as Brazil, Colombia, Philippines, Indonesia, South Africa and Sri Lanka, have managed to prevent slums from growing and even reduced them through good housing and employment policies.